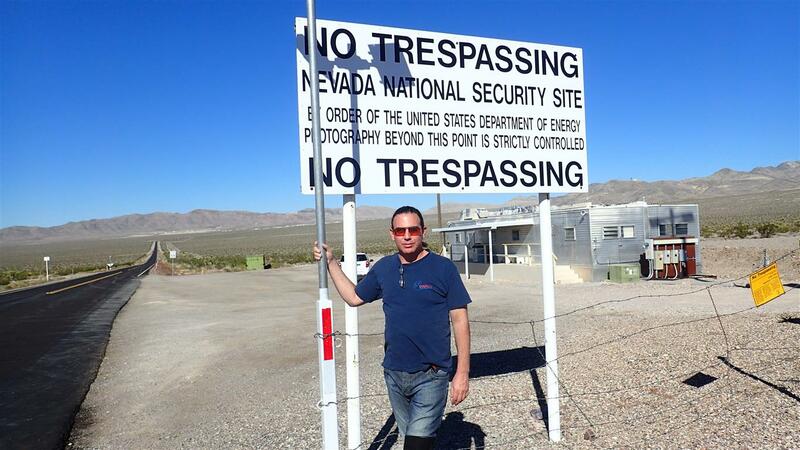 I went on a UFO hunting tour with Richard from PlanetXV near Nevada’s Area 51 infamous secret base. The”top of the line” exquisite limo that took us to the observation site had several TV monitors inside where Richard claimed I would be seeing the UFO’s in the skies “live” as if I were in the comfort of my private leaving room. The ride to our main destination took us around 1 hour from our departure location on the Las Vegas strip. This short trip was necessary to be away from the strip bright lights and near the secret bases were UFO activity has been reported for over a half century. It happened quite spontaneously, after I casually picked up a Planet XV brochure in the lobby of the hotel I was staying. Since, I already knew about Area 51, I was immediately drawn to the glossy brochure which displayed the little Grey Aliens – Hard to pass that up, and I was curious. The technology Planet XV used was awesome. I found myself scanning the night sky for “unknowns” (aka UFO’s) with military-grade night-vision goggles, and also viewing these object on the big screen simultaneously. The idea of a “UFO Sighting” near Area 51 is just too good to pass up. Even though I think it’s arrogant to believe that humans are the only intelligent life in this vast universe, as a child, I loved the idea that E.T.’s could be real, and the thought that flying saucers from other worlds exists always intrigued me. Nevertheless, I’ve been always drawn to the unkown and questionable, and Nevada is an epicenter for secret projects hidden away from the casinos. Las Vegas attracts visitors from around the world who are drawn to money and pleasure, and now it goes beyonf the stratosphere. 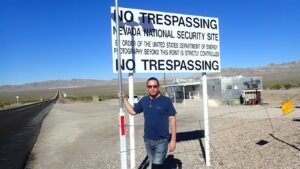 My guide was Richard Mondio, a Steven Segal look alike, the founder of Planet XV nightly UFO sighting tours that departs from the Gold Coast casino parking lot – an easy access to any location on the strip. 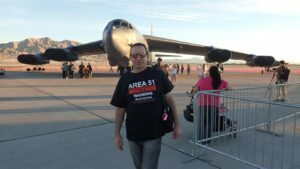 Richard is an amateur astronomer who is a member of the local Las Vegas chapter astronomical society and also a member of MUFON. Richard started his astronomy science journey at the young age of 14, when he was hires to work at the prestigious Center for Radio Astronomy in Brazil – where he grew up. What is UFOlogy? Exactly what it sounds like: the study of all things related to unidentified flying objects. It was coined in the 1950s, not long after the Roswell incident stirred interest in theories and conspiracies surrounding extraterrestrial encounters on Earth. These encounters aren’t new, as the Native Americans in Nevada and elsewhere in the Southwest have been visited from the “star people” (aka aliens) for centuries. Depictions of these alien beings from out of space can be seen around Nevada sketched on rocks in petroglyphs dated thousands of years old. If UFO activity has increased significantly, as some claim, in recent years, it’s because now everyone owns a camera or video recorder inbuilt in their cell phones! My UFO sighting tour kicked off just after sunset. The first few hours after sunset or before sunrise are the best time to spot “unknowns” in the sky because as the sun positions itself just below the horizon, it can still reflect its light onto objects flying high above the earth. We drove to two different locations to scan the sky with military-grade third-generation night-vision goggles. Costing roughly $3,500 per pair, the goggles are pretty badass. They amplify 20,000 times more light than is capable of being seen by the naked human eye. When I looked through them, I could see thousands of stars above, including numerous shooting stars. The constellations viewing alone was spectacular. When I scanned the landscape of the Earth around me, however, everything was an eerie green hue. This spooked me out, especially given the nighttime total silence, not knowing if a little green man would pop up out the bushes or or from behind a rock formation to abduct me. So I kept my eyes to the sky. It’s where I hoped they belonged, anyway. I was told to look for quick-moving orbs of light in the sky and to follow their trajectory. He explained that commercial airplanes and military aircraft have a rhythmic blinking light, and satellites, while unblinking, travel all the way to horizon. “Unknowns,” on the other hand, would be unblinking lights that vanish at least 30 degrees above the horizon — signaling that the object left orbit. Melinda said this is evidence that whoever or whatever was controlling the object is an intelligent life form. Engineers or pilots would not be able to help me on this tour with my technical questions, because most of them like to say “There must be a logical explanation for this”! We spent nearly three hours watching the sky, with Richard peppering the silence with stories of past sightings, and answering many of my questions trying to sound intelligent while covering up for my fear of possibly being abducted on the site! While my experience wasn’t not the “Close Encounters of the Third Kind”, I did spot nine “unknowns” object in the sky during our time together. One in particular was a triangular shaped craft that put the fear of God in me. Whenever Richard would see something through our goggles, he’d shine a green laser pointer into the sky to identify it for the other person. I used the laser to point out the location of a fast-moving, unblinking object I spotted. After I did this, the “unknown” flared back at me as if it wished to communicate with me. We tried to shine the laser at it again, and once more, it flared back at us, even brighter than the first time, before disappearing shortly thereafter, almost directly above us. Could it have been a UFO manned by an intelligent life form from a galaxy far, far away? And if it was, did we piss it off? Or was the bright flare a friendly acknowledgement? Did E.T. just say “Hello” to me? Whatever it was up there, it appeared to react to that green laser pointer, and that scene both excited me and scared the crap out of me. As someone who’s been on hundreds of guided tours — from camel rides around the Great Pyramids of Giza to scholar-led walks through Vatican City — I recognize that a UFO sighting tour falls outside the boundaries of a “normal” travel tour. One of the great joys of traveling, at least for me, is the opportunity to challenge your curiosity and learn something new — even if it means chasing UFO’s with night-vision goggles in the middle of the Nevada desert! Keeping an open mind while on the road can inspire travel memories you never imagined, ones that linger long after you’ve unpacked your bags back home. After my UFO sighting tour, for instance, I’ll never look up at the sky in the same way again. Certainly not after that “wink” amid the stars … possibly from E.T. himself.